Most garments worn by people during the Regency period have long disappeared, well-worn and well-laundered until the fabric from which they were made became too threadbare or full of holes to appear in public. Any late eighteenth or early nineteenth-century clothing that has survived to this day likely resides in a the collection of a museum, lovingly protected from the touch of human hands. A devoted researcher could spend her entire life traveling from museum to museum, examining first-hand the scattered riches, and still never be able to see them all. Those of us interested in knowing what such garments looked like, and understanding what it felt like to wear them, then, typically have to resort to more indirect means: most often, printed reproductions, either in secondary sources on the period, or in primary sources from the period itself. 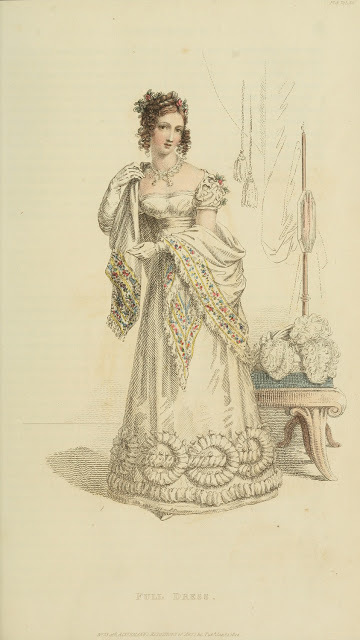 One of the most fascinating primary sources about genteel women’s clothing in the Regency are the fashion plates that appeared in the monthly periodical, Ackermann’s Repository of Arts, Literature, Commerce, Manufacturers, Fashion and Politics (1809-1829). Each issue featured two color fashion plates, accompanied by detailed written descriptions of their fabric and styling. Catching sight of the originals of these plates, though, can be almost as challenging as viewing the actual period garments. Issues of Ackermann’s are to be found in many an academic library, but as I understand, many issues have been subject to vandalism, with industrious thieves in the days before heightened library security stealing into the stacks and slicing out the precious plates from their bindings. Complete editions of the entire Ackermann’s periodical run owned by the Philadelphia Museum of Art have been scanned and are available to download in various formats through archive.org (see Jennifer Jermantowicz’s handy index here). But if you’re only interested in the prints, it can be a bit tedious to go wading through long articles on such subjects as “On the Orthography of the Surname of the Composer of the Messiah,” or stories about “The Viccissitudes of a Half-Guinea” (vol. 13, issue 73, Janaury 1822) and the like. Various researchers have put up individual Ackermann prints on the web, and quite a few Pinterest boards can be found devoted specifically to Ackermann plates. And Artist EKDuncan has uploaded a complete set of plates to her web site (see links at bottom of page, below the prints for 1828). But such prints rarely include the text descriptions that accompanied them in the original periodical. 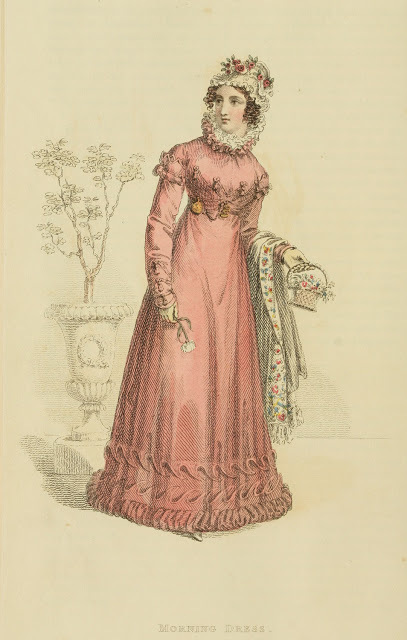 Photo credits: “Morning Dress,” and “Full Dress,” Ackermann’s Repository vol. 13, issue 73, January 1822, page 52. Courtesy of EKDuncan. I love the serendipity of research, the strange and curious facts and stories that one comes across while looking for something completely different. Not all of them are things I can include in my fiction writing, but I still find them fascinating enough to think that others may enjoy reading about them, too. 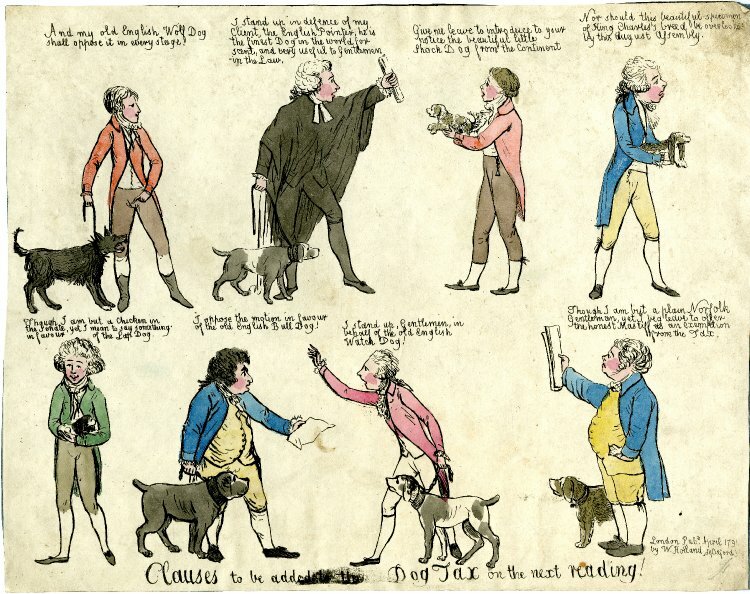 Hence the idea for “Regency Curiosities,” an occasional series of posts about the odd, amusing, and occasionally even outright shocking tidbits I come across while engrossed in Regency history. Dead dogs? Delivered to a respectable partner of a bank that catered to the nobility? Here was a mystery. Why would someone send poor Mr. Dent not only tasty bits of game, but also the remains of man’s best friend? Did it have something to do with this dog tax that author Price mentions in such an offhand way, as if readers in 1902 would of course know what it was? Instead of reading more about banking, then, I set off on a search for more information on Mr. John Dent and his role in the creation of what would seem to be a rather hated tax. Bad harvests, as well as war with France, had sent food prices soaring; paying to feed a pet was seen as a sentimental indulgence, one only the rich could, and should, afford, Dent and his fellow tax supporters asserted. Is a dog a sentimental indulgence, a luxury? Or a necessity? These were the grounds upon which heated debates about the proposed tax were voiced. Opponents argued that the government was wrong to view the dog as an unnecessary possession; taking away man’s dog was tantamount to taking away his liberty. In contrast, proponents believed that the poor had chosen an improper object for their affections, and would do better to feed themselves and their progeny than an animal. Despite protests against the very idea of a dog tax, an “Act for granting to His Majesty Certain Duties on Dogs” (36 Geo. 3, c. 124) was passed by Parliament on May 19, 1796. The bill included three levels of tax: people who paid assessed taxes owed 5 shillings per dog for a hunting dog, or for two or more dogs of any type; similarly, they would pay 3 shillings for a non-hunting dog; the poor, who did not pay any assessed taxes, would only be taxed if they kept a hunting dog, or more than one dog. John Dent, though, seems to be the only party who was verbally branded for his role in the dog tax debates, perhaps because his parliamentary speeches in support of the tax were “so replete with bitterness against the nuisance of dogs that Windham declared he could almost fancy Actaeon was revived, and revenging his injuries by a ban against the whole canine race” (Festa 34, note 1). *My source for information about John Dent and the dog tax is Lynn Festa’s article, “Person, Animal, Thing: The 1796 Dog Tax and the Right to Superfluous Things.” Eighteenth-Century Life 33.2 (2009): 1-44.